Newborns sleep a lot - typically up to 16 to 17 hours a day. But most babies don't stay asleep for more than two to four hours at a time, day or night, during the first few weeks of life. Baby sleep cycles are far shorter than those of adults and babies spend more time in rapid eye movement (REM) sleep, which is thought to be necessary for the extraordinary development happening in their brain. REM sleep is lighter than non-REM sleep, and more easily disrupted. 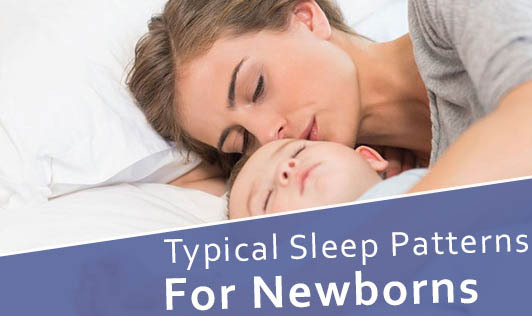 All this unpredictability is a necessary phase for your baby and it doesn't last long - though it may seem like an eternity when you're sleep-deprived. At 6 to 8 weeks of age, most babies begin to sleep for shorter periods during the day and longer periods at night, though most continue to wake up to feed during the night. They also have shorter periods of REM sleep, and longer periods of deep, non-REM sleep. Somewhere between 4 and 6 months, experts say, most babies are capable of sleeping for a stretch of 8 to 12 hours through the night. Some infants sleep for a long stretch at night as early as 6 weeks, but many babies don't reach that milestone until they're 5 or 6 months old and some continue to wake up at night into toddlerhood. You can help your baby get there sooner, if that's your goal, by teaching him good sleep habits from the start. Learn the signs that mean he's tired. For the first six to eight weeks, most babies aren't able to stay up much longer than two hours at a time. If you wait longer than that to put your baby down, he may be overtired and have trouble falling asleep. Watch your baby for signs that he's tired. Is he rubbing his eyes, pulling on his ear, or being more fussy than normal? If you spot these or any other signs of sleepiness, try putting him down to sleep. You'll soon develop a sixth sense about your baby's daily rhythms and patterns, and you'll know instinctively when he's ready for a nap. Begin to teach him the difference between day and night. Some infants are night owls (something you may have gotten a hint of during pregnancy) and will be wide awake just when you want to hit the hay. For the first few days you won't be able to do much about this. But once your baby is about 2 weeks old, you can start teaching him to distinguish night from day. When he's alert and awake during the day, interact with him as much as you can, keep the house and his room light and bright, and don't worry about minimizing regular daytime noises like the phone, music, or dishwasher. If he tends to sleep through feedings, wake him up. At night, don't play with him when he wakes up. Keep the lights and noise level low, and don't spend too much time talking to him. Before long he should begin to figure out that nighttime is for sleeping. Consider starting a bedtime routine. It's never too early to start trying to follow a bedtime routine. It can be something as simple as getting your baby changed for bed, singing a lullaby, and giving him a kiss goodnight. Give him a chance to fall asleep on his own. By the time he's 6 to 8 weeks old, you can start giving your baby a chance to fall asleep on his own. How? Put him down when he's sleepy but still awake, suggests Jodi Mindell, associate director of the Sleep Disorders Center at Children's Hospital of Philadelphia and author of Sleeping Through the Night. Mindell advises against rocking or nursing your baby to sleep, even at this young age. "Parents think that what they do this early doesn't have an effect," she says, "but it does. Babies are learning their sleep habits. If you rock your child to sleep every night for the first eight weeks, why would he expect anything different later on?" Not everyone agrees with this strategy, however. Some parents choose to rock or nurse their babies to sleep because they believe it's normal and natural, because they enjoy it and their baby is thriving and sleeping well, or simply because nothing else seems to work. These parents expect to get up with their baby several times during the night to help him get back to sleep. At 6 to 9 months, your baby may be learning to sit up, crawl, or possibly even cruise or walk- quite a list of achievements! Not surprisingly, he may not want to stop practicing his new skills at bedtime and may get so excited that he'll wake up to try sitting up just one more time. Separation anxiety could also be the cause of your baby's wake-up calls. Waking up and finding you not there may cause some distress. But he'll probably calm down as soon as you reach out to him/her.